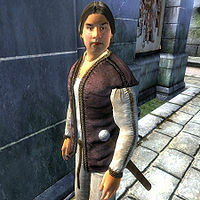 Collatinus Vedius is an Imperial commoner living at the house of Matthias Draconis in the Imperial City's Talos Plaza District. Collatinus lives in Matthias Draconis' house where he walks around on the bottom floor most of the time. He does not sleep at all and skips breakfast. At 12pm he leaves Matthias' home and goes to The Foaming Flask for lunch before returning home at 2pm. He then wanders around for four hours and then eats from 6pm until 8pm. Upon finishing his dinner he walks around the lower floor of the house for the rest of the night. He follows this schedule every day of the week as well as on the weekends. The only exception to his routine is during Light the Dragonfires, when all citizens are restricted to their houses under martial law. He wears middle-class attire and a piece of light armor consisting of a brown shirt, light brown linens and leather boots. He also carries a small amount of gold. In combat he relies solely on a fine iron shortsword. Collatinus Vedius was intended to sleep from 10pm until 6am, but has no bed to sleep in, making Matthias more difficult to get to during the Dark Brotherhood quest Next of Kin.